There are many formats of video files available in the web and market. The quality of the video depends on the format. AVI is one of the latest types with excellent bit rates, automatically leading to good quality of the video. Despite the quality and the familiarity of the format, there are some situations where this particular format has to be avoided or changed. We can also quote the example of reducing space in the disk in which we are putting it to. Hence the conversion of the file formats has now been a usual thing. We need some special soft wares for performing these conversions. We can download them using the internet. Some of the converting software’s are listed here, total video converter, prism video converter. Either of the above two or any of the available video converters are being utilized for the conversion of the video files. The first thing to do is downloading the free version of the prism video converter using the internet. Then install the set up file in your computer. After installing the file, open it. After opening the software, you will find the add symbol or icon from which you can search for the avi file that is to be converted into the wmv format. Then select it. In the bottom corner you will find the output format pop down list, in that list select the wmv format, as you are trying you convert it into wmv. You can use the converter for conversion of many video formats (only if the software is downloaded with its full features). Then using the browse option set the target folder (i.e. the place where the converted file has to be stored) for future uses. After giving the converter all these instructions press the convert command button, to initiate the conversion process. If there is need for any codec, the converter will ask you for it; allow it to automatically download the required codec from the internet. Once the convert command button is clicked, the conversion process would have initiated and the software or the convertor should be left alone, don’t try to start another when the first one is in process. After a few seconds or minutes depending on the size of the input file the conversion would be completed. Once the conversion is completed, the video in wmv format can be used by browsing the target folder. The advantage of using this is, even after the conversion, the original file in the avi format will be in tact and it can be used anytime. The conversion of the avi to wmv is simple, but we have to give up the quality of avi along with it. 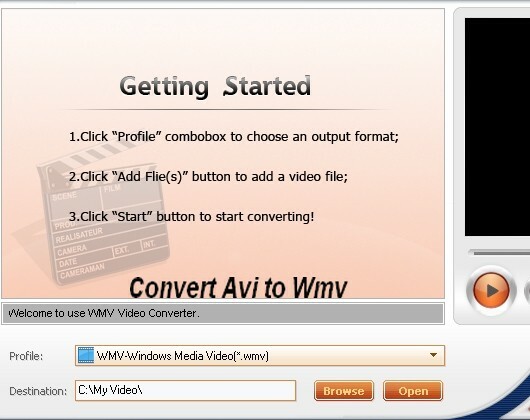 Learn more on how to convert avi to wmv.